Nokia made the headlines with the Android-powered X line of devices (X, X+ and XL) but the affordable Nokia 220 and Asha 230 are also on display. Both feature dual-SIM versions as well. We got to spend some quality time with the 220 and Asha 230. The 220 starts at an insanely-low €29 while the Asha 230 starts at €45. Both devices we handled at the Mobile World Congress were yellow. The Asha 230 is a touchscreen device – even the back button is capacitive. There are physical unlock and volume keys. It has a 2.8″ screen of QVGA (320 x 240) resolution and clocks in at 142 pixels per inch. 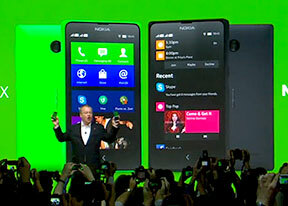 The Asha 230 includes Nokia’s Glance screen tech, a slap in the face of the Lumia 520. The Nokia 220 has a 2MP camera on the back. The plastics used in the Asha 230 feel even lesser in quality compared to the Nokia 220. The Asha 230 is heavier at 89.3 g.
The screen looks okay at these specs. The Asha UI isn't immune to stutter, probably due to the lower-end internals. The Asha 230 comes with a 1020mAh battery that’s good for 33 days of stand by time according to Nokia. Talk time over 2G is rated at 11 hours. There’s a 1.3 MP camera on board. The Nokia 220 is a non-touch device which focuses on the bare necessities in order to accommodate the €29 price tag. The 220 comes with only 2G connectivity, skipping even Wi-Fi along the way. It does, however, feature preinstalled Twitter and Facebook apps. The plastic used in the 220 isn’t the best but feels okay to the touch. At this price point we can’t really expect miracles, the phone is very thick at 13.2 mm for starters. The UI is fluid enough and the buttons are good and those not enamored with touchscreen will love the full numpad. The 2.4″ QVGA LCD offers an unimpressive 166 ppi but has good colors. The 220 weighs a manageable 83.6 g.
The Nokia 220 is available starting today while the Asha 230 will start hitting the shelves in March.